Ahu Tongariki. The second moai from the right has a pukao on its head. Ahu Tongariki with volcano Poike in the background and the nearby "Traveling Moai" in the foreground. Ahu Tongariki was the main centre and capital of the Hotu Iti, the eastern confederation of the Rapanui. Its moai were toppled during the island's civil wars. In 1960, a tsunami caused by an earthquake off the coast of Chile swept the Ahu Tongariki inland. Ahu Tongariki was substantially restored in the 1990s by a multidisciplinary team headed by archaeologists Claudio Cristianao Bob (Director) and Patricia Vargas Gay (Co-director executive team), in a five-year project carried out under an official agreement of the Chilean Government with Tadano Limited and the University of Chile. Map of Rapa Nui showing major ahus with moai. Ahu Tongariki, and Rano Raraku are on the South coast just before Poike at the eastern end of the island. This ahu is on the south coast of Rapa Nui, close to two previous volcanoes, Rano Raraku and Poike. Poike is one of the three main extinct volcanoes that form Rapa Nui, which last erupted between 230,000 and 705,000 years ago. Rano Raraku is a volcanic crater formed of consolidated volcanic ash or tuff, which compose the carved moai. 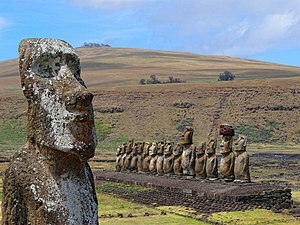 Indeed, nearly half (hundreds) of the moai are still buried in the slopes of the Rano Raraku, the main moai quarry. The large, flat plain below Rano Raraku provided easy access to the tuff. Ahu Tongariki in 1914. At the time, all the coastal moai were still overturned. Wikimedia Commons has media related to Ahu Tongariki. This page was last edited on 6 March 2019, at 17:39 (UTC).